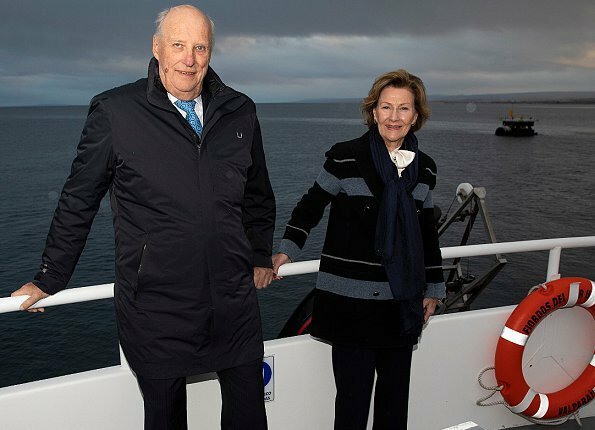 On the third day of their official visit to Chile, March 30, King Harald and Queen Sonja arrived in Punta Arenas in the south of Chile. Punta Arenas is a port city located on the Strait of Magellan and is a base and departure point for expeditions to the Antarctic. 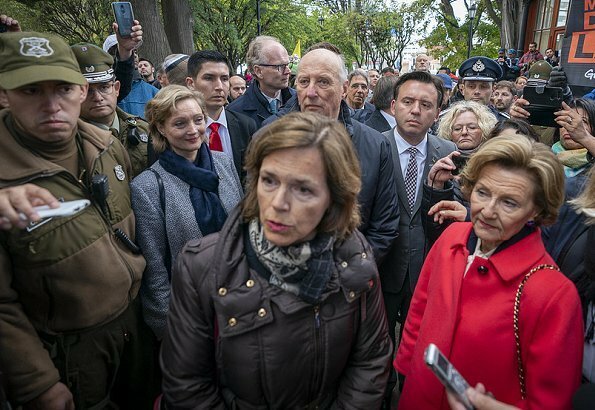 King Harald and Queen Sonja of Norway were officially welcomed to Punta Arenas with a ceremony held at the main square of the city, consisting of national songs and traditional singing and dancing. The welcoming ceremony took place near a large monument to the seafarer Ferdinand Magellan. 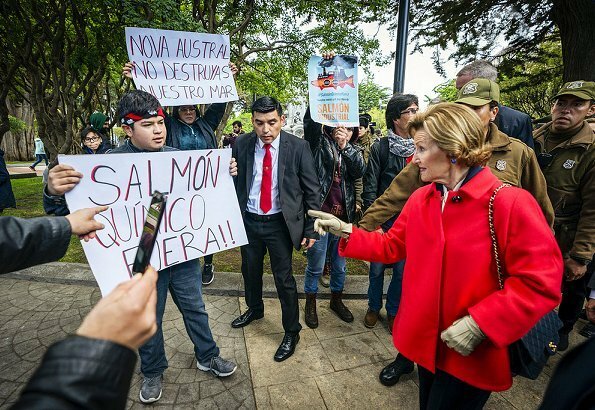 Demonstrators protesting against Norwegian aquaculture were also present. 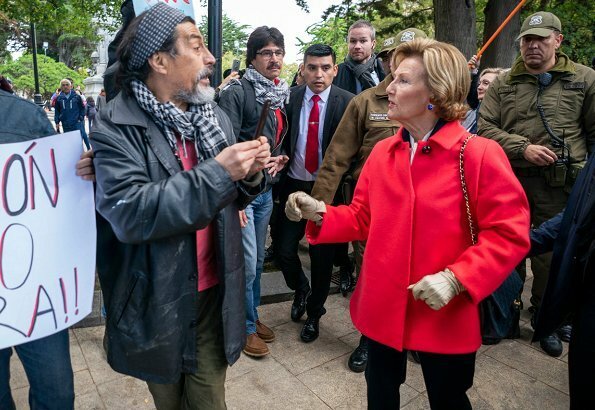 After the welcoming ceremony, mayor of Puntas Arenas Claudio Radonich presented the keys of the city to the King and Queen with a ceremony held at the city hall. After the formal key presentation ceremony, the mayor took the King and Queen on a walk through Punta Arenas. 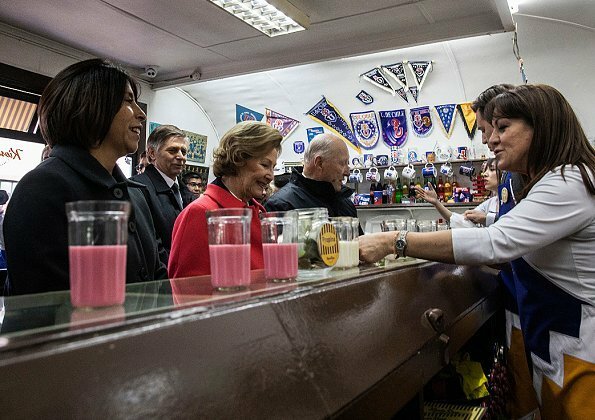 During the walk, the mayor and the King and Queen stopped at Kiosko Roca, a colourful cafe that serves picados and other local specialities at its bar. The café has been a gathering spot for city residents since the 1950s. 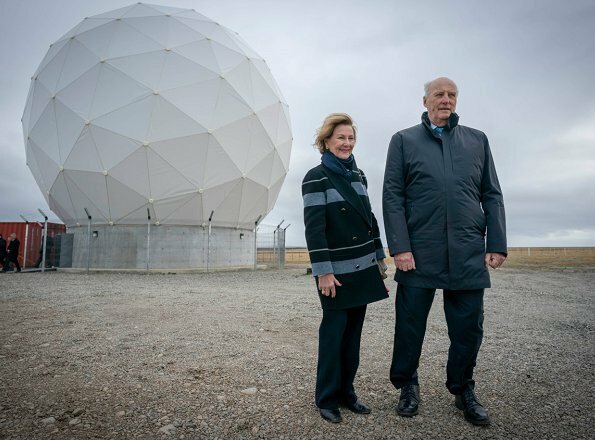 In the evening, King Harald and Queen Sonja visited the satellite station outside Punta Arenas, and the King and Queen had the opportunity to experience the Strait of Magellan from the deck of a catamaran. The Strait of Magellan separates the South American mainland from Tierra del Fuego. 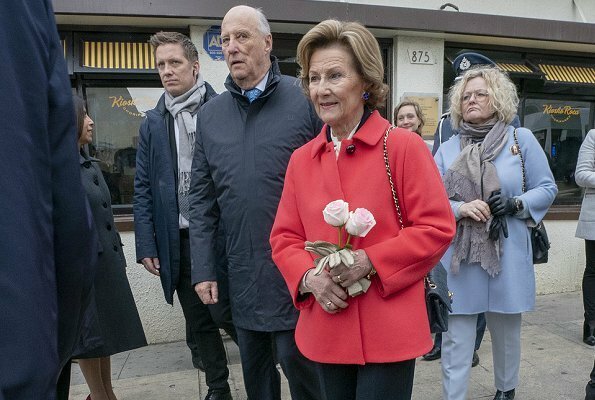 Queen Sonja always looks stylish and beautiful! Indeed. The king is also looking great. I agree. 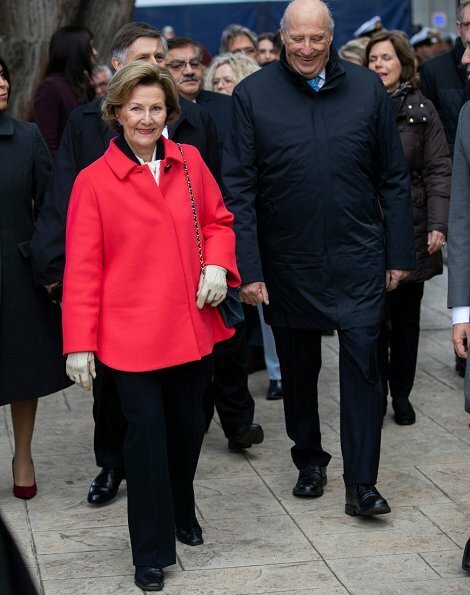 I admire this royal couple! Agree, they seem to be very open minded and have true friendship for each other and love also. Lovely colour of jacket which just looks so stylish on the Queen. In the photo of the protesters, love the way the Queen appears to be genuinely interested in what the placards say and also the protester nearest the camera is still trying to make sure he gets a photo of the Queen. Excellent! Very hard working King and Queen. Sonja is always spot on.